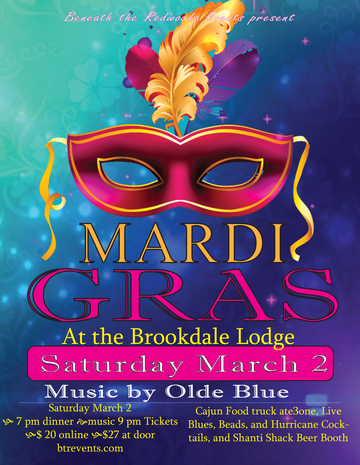 Mardi Gras in the Mountains Party. We are recreating the New Orleans Mardi Gras in the Santa Cruz Mountains. Held at the famous Brookdale Lodge. There will be food trucks with traditional New Orleans food, live music featuring local legendary blues band Olde Blue,Beer tents from Shanti Shack, hurricane booth, and lots of beads. Dress to impress and wear a mask because we are going old school, deep south, French Quarter style of party. Discounted rooms will be available and highly suggested for this party. Just mention you have tickets and you will receive the discount.